As the hypothetical iPhone 5 gets closer to its expected announcement this fall, the speculation is growing in volume and intensity. This latest bit comes courtesy of a random graphic found residing on news outlet Bloomberg’s site by 9to5Mac. In the graphic, Bloomberg lays out the hypothetical cost of a new iPhone from Apple, broken down by component and relative percentage of the device’s presumed cost. At the moment, the graphic does not accompany any story and gives as its source only ‘Bloomberg Industries Estimates’. The graphic is worth mentioning though as Bloomberg does have a wide net of industry contacts and it seems likely that they could produce a fairly accurate barometer of what an iPhone 5 might cost. 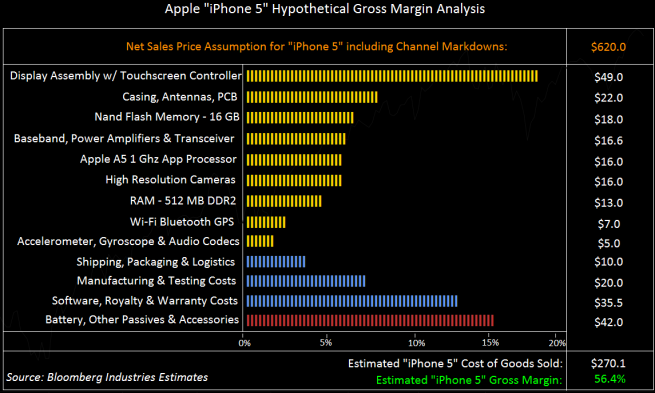 The graphic surmises a total cost of $270.1 for the materials and manufacturing of the iPhone 5, leading to an estimated gross margin of 56.4%. Seeing as they’re using 16GB of Nand flash memory to prepare the estimate, and they’re assuming the 16GB iPhone 5 will be sold at $620, with some channel markdowns. The 16GB iPhone 4 is currently sold at $649 in its unlocked form. We think that Bloomberg’s list is mostly accurate in composition, although the amount of RAM seems low as we’d expect to see 1GB in the new iPhone. Unsurprisingly the touchscreen and battery components make up the bulk of the cost.